This is God's power and he sent this thing to warn us ... we needed a shock. Just when things get a little sleepy on the plateau, we have that old predictor and prophesizer, Pat Robertson to get things going. 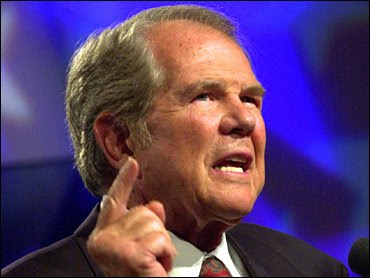 Pat Robertson said Tuesday God has told him that a terrorist attack on the United States would result in "mass killing" late in 2007. Robertson said God also told him that the US only feigns friendship with Israel and that US policies are pushing Israel toward "national suicide." Isn't this guy a trip?